Good source of information on a variety of medical and behavioral problems with pets, as well as descriptions of many medications. Click the above. Excellent resource relating to pet poisonings (toxicities). Click above or call (888) 426-4435. Click above to learn about important tick-borne diseases of dogs (such as Lyme and others), and heartworm disease (mosquito-transmitted). Excellent information and incidence maps. Click above for drug and food recalls. Be prepared for an emergency. Don’t forget your pets! Click above. 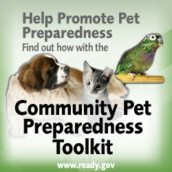 Make sure to check out the “Community Pet Preparedness Toolkit”, video and lots of other useful information. Click here for an interactive tool to understand the prevalence of these three feline infectious diseases in your area, including information matched to your cat’s age and living environment. Feline Immunodeficiency Virus (FIV), Feline Leukemia Virus (FeLV), and Feline Heartworm.